In gear manufacturing, precision gear grinding is a finishing process which uses abrasive wheels to remove small variations on gear teeth. It is widely known to be the most accurate way to finish a high precision gear, offering a more precise tooth finish than gear cutting. Due to their precise gear geometry, precision ground gears offer excellent meshing effectiveness and a smooth operation, running more quietly and wearing more evenly than cut gears. They can also handle higher loads, and are useful when large amounts of torque are required. For these reasons, they are often found in equipment that demands high performance and reliability. 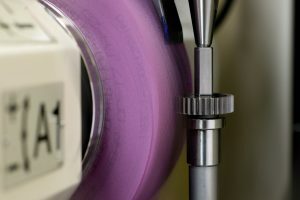 At Gear Motions, precision gear grinding is our specialty. 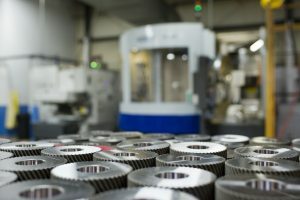 We offer precision gear grinding as a final step in the manufacturing process of a complete gear, or as a gear grind only service through our Pro-Gear division. Gear Motions can produce the highest quality precision ground gears in the industry. Our ground gear manufacturing capabilities include diameters from 0.5″ to 27.5″, a maximum face width of 12.9”, and a pitch diameter of 48 to 1.7 DP. Our gears are custom made to your requirements, and adhere to tight customer specifications and AGMA tolerances up to Q15. Precision gear grinding services at Gear Motions are also extremely cost effective. Our team has over 100 years of combined experience, and we utilize advanced equipment to meet your precision gear grinding needs at unmatched levels of quality and productivity. Want to see how your product can benefit from using precision gear grinding services at Gear Motions? Contact us to speak to one of our sales engineers about your project today. Pro-Gear Co. Inc. Joins Gear Motions Inc.